Top tips for keeping cool! Dogs overheat realy quickly, they dont sweat all over like we do, and very rarely as last resort to cool down will sweat from their feet. Panting is the main temperature regulator second to vasodilation. 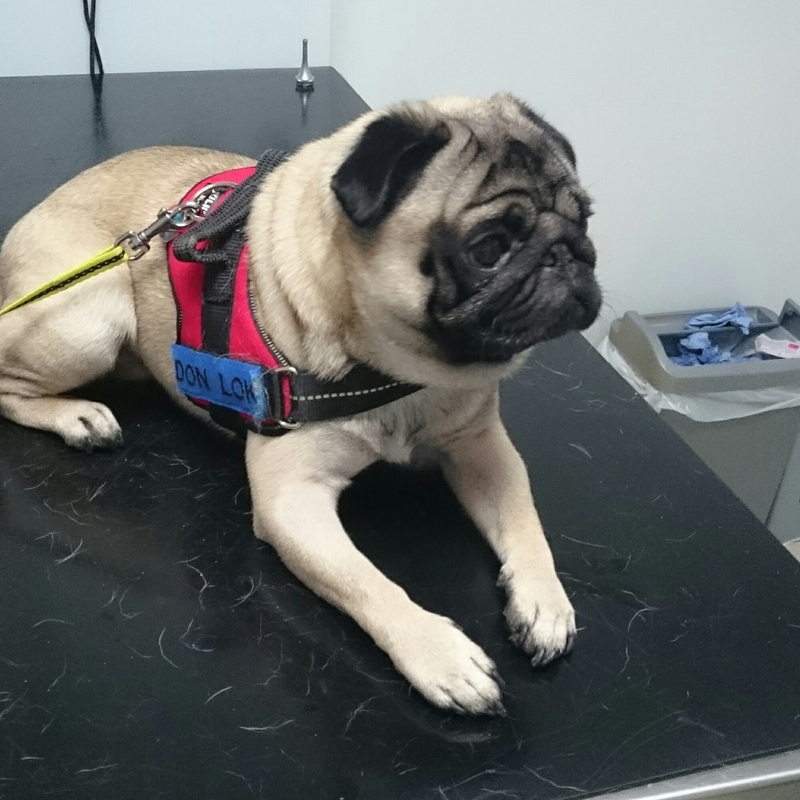 Pugs and other brachycephalic breeds have further struggle to regulate. 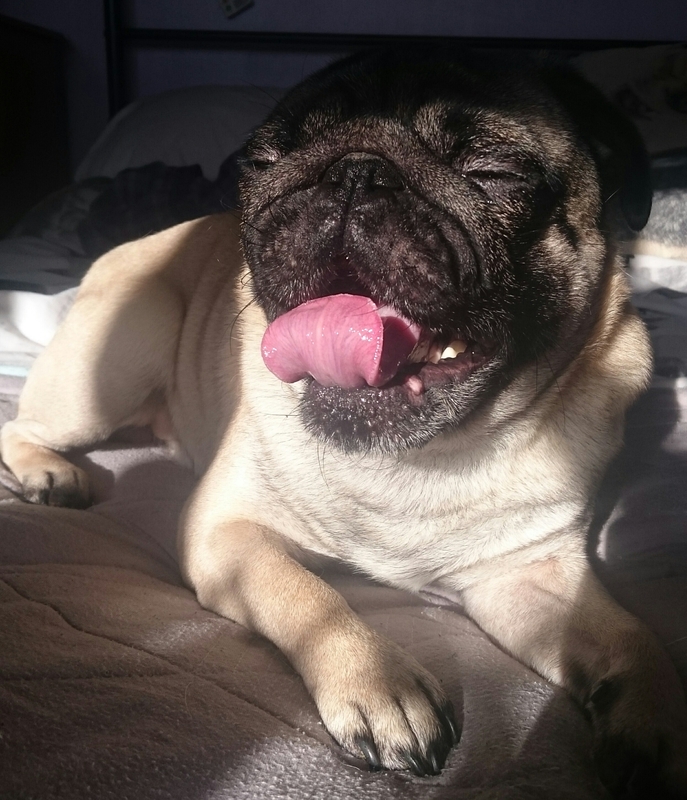 Here are some tips from the Don to aid in keeping your dogs cool in hot weather. Freeze yoghurt in a kong or ice cube tray as a cool dog lolly treat. Cool matts can be ideal but expensive, (depending where you buy) all you need to do is roll up a baby change matt or thin blanket/sheet or towel, store in the freezer and get out for you dog when they get really hot. 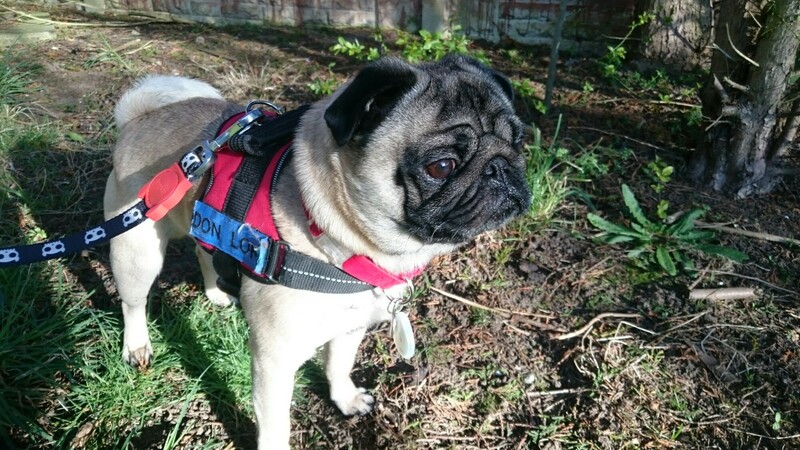 Restrict long walks to early morn or late evening when its cooler, brachycephalic breeds over heat very quickly so my human doesnt take me on walks in hot sunshine as (even though I dont have breathing difficulties) I cant cool down quick enough and get restless! Take some water with you for pitstops on walks to rehydrate. Never leave us dogs in hot cars, ever. Even if you leave the windows open it can take under 15 minutes for a dog to dehydrate and die in a hot car or even suffer heatstroke and brain damage. Its not worth the risk. 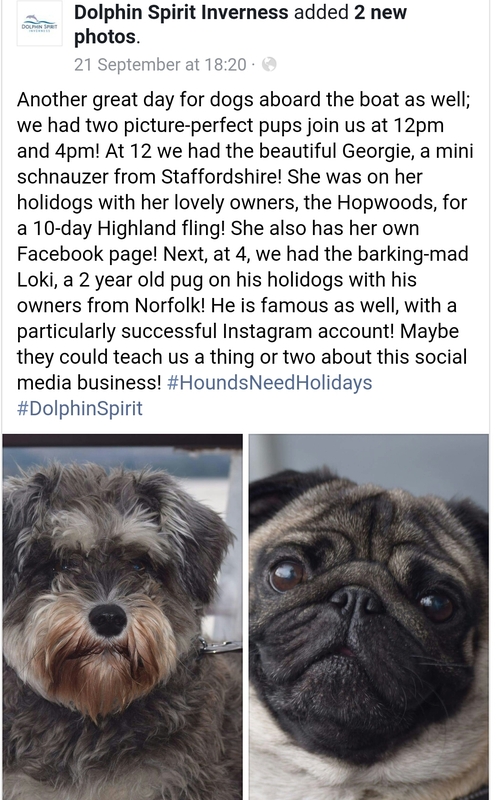 Leave us at home! For those is hotter climates you also need to check pavement temperature so we dont burn our paws. This is also the same for super cold climates as ice burns too! We have a way to go until the weather warms up in the UK but it’s always best to be prepared. Post any tips you have in the comments. 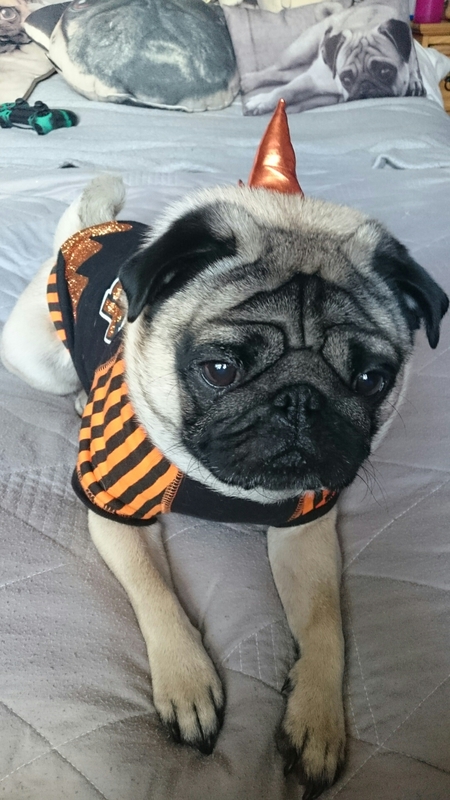 Today I went on my first pug meet up, a great socialising event for any dog. Our journey was about an hour by bus so first of all we made sure bladder and bowels were empty…always handy. Last thing you want is a poo happening on a bus! Next human made sure to I was wrapped up warm (for the cold weather) and got on my secure harness. Now here it all depends on bus company and driver. 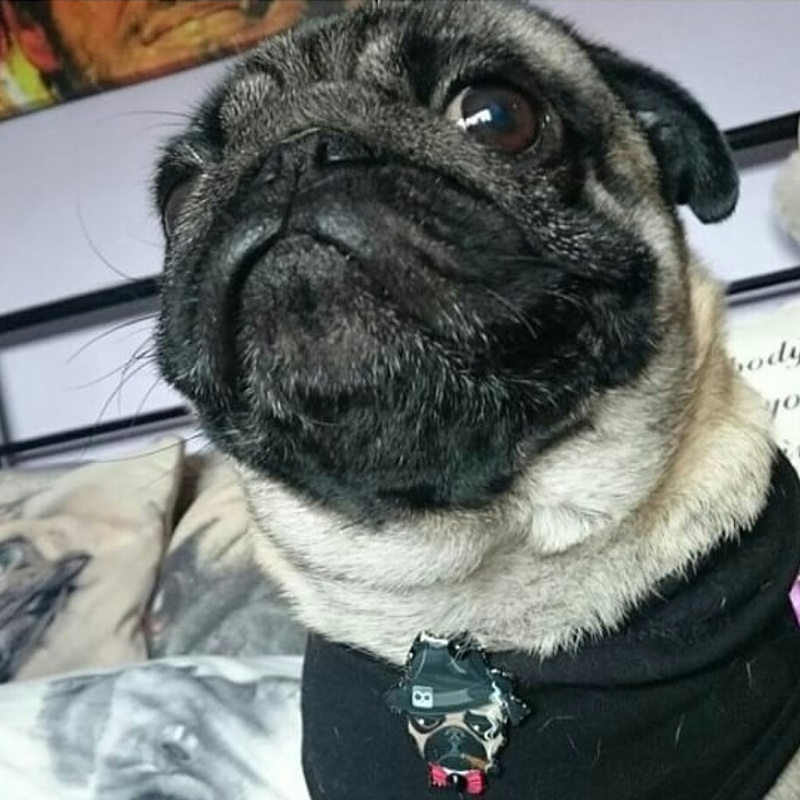 We have never encountered any problems or refusal travelling by bus as dogs are allowed on buses, Sometimes I sit on the seat (this can be an issue with some people), to be honest I only get to sit on the seat if im clean, on a coat/blanket or on humans lap, the rest of the time it’s the floor. Today I sat on humans coat. On the way home we caught 3 buses and most were quite busy so sometimes we stood, we try to stay near the front on shorter trips and tucked away upstairs for longer. We try to avoid to much attention from strangers so I dont get riled up. Human always brings along my favourite toy (burger 🍔 of course). With a handful of treats and a bottle of water for after the journey. Most of the time I just sleep. Here is where it gets a bit trickier when getting a taxi with a dog always make sure while calling one or before getting in they accept dogs in the cab. 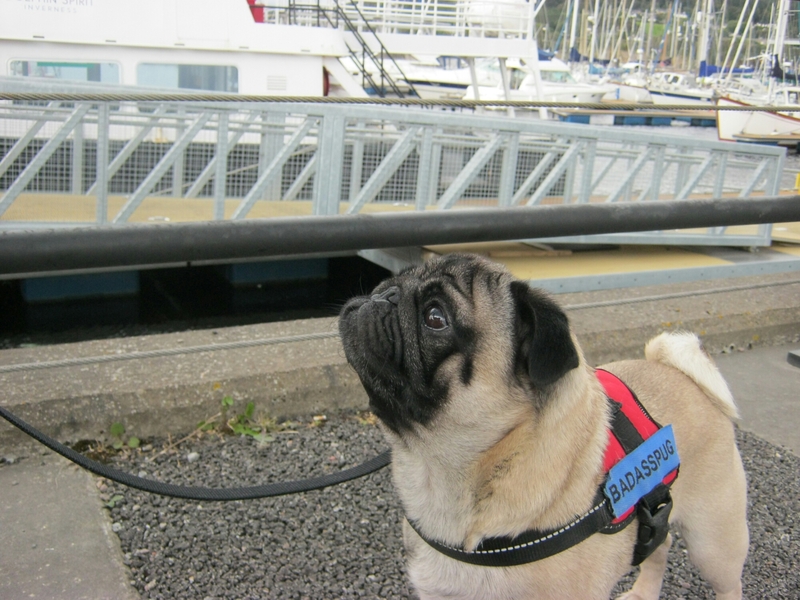 In humans experience she always tells the operator what dog I am (Pug) so they send a car that will accommodate. Human has been told (by a driver) some drivers will sneakily add a fee for the dog at the end of the fare so always be upfront! Obviously some drivers will refuse. Today we got accepted first time, after being asked breed and being requested that I stay on the floor. All in all a great day out. We can’t wait for the next one..which we won’t be late for (humans fault). 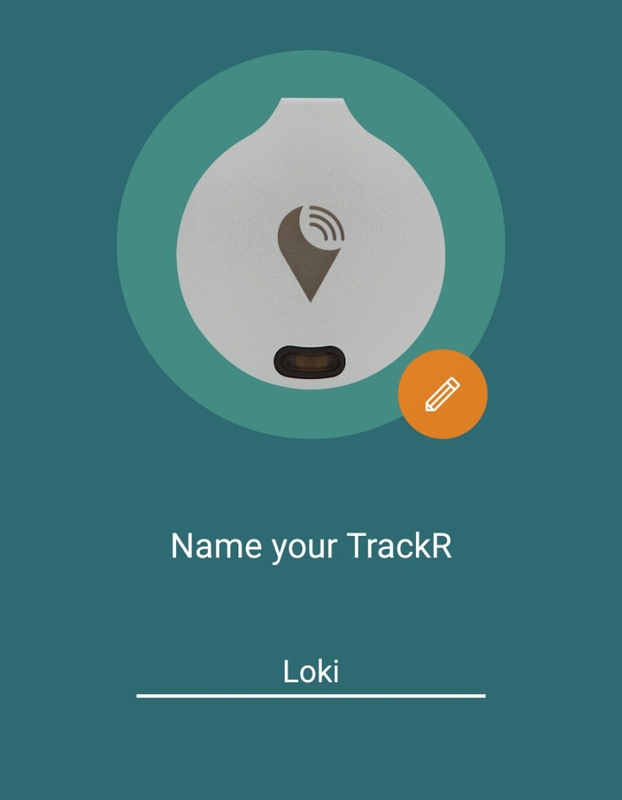 The kind people at TrackR contacted us to try out one of their TrackR Bravo Bluetooth devices, which peaked our curiosity as I have an ID chip but what if I get lost? So we thought a tracker sounded a pawsome idea. 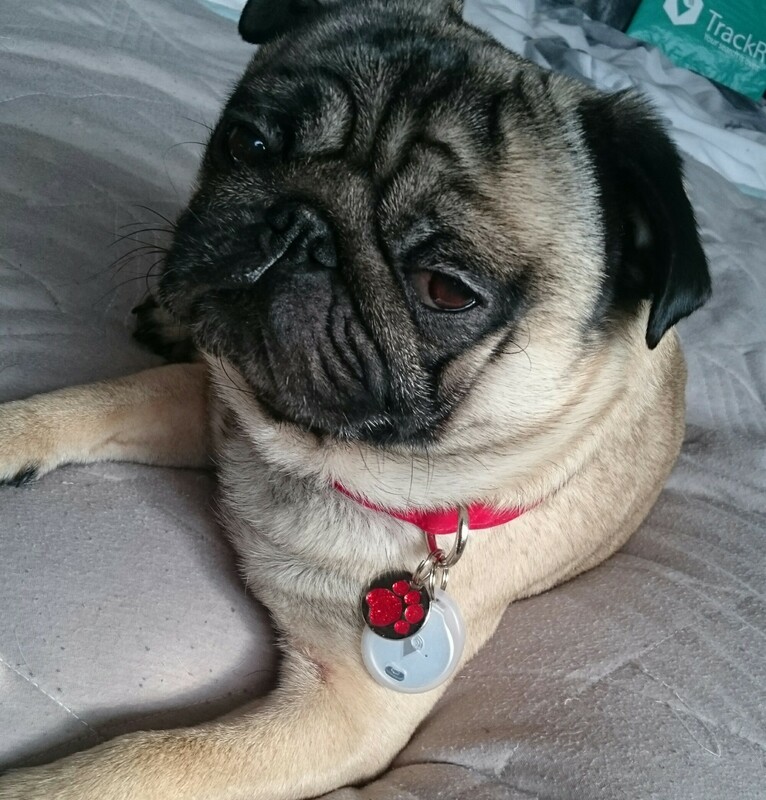 The device comes with a ring to attach to my collar or harness and a sticker (as it can also be used to track other things like phone, keys etc) our device is silver but you can get other colours which do cost more! and even a custom photo or engraving.We also got the water resistant sleeve which is great for walks in woods when it may rain or I “accidently” fall into puddle. It is so super easy to set up on iphone or android, just download the app turn on your bluetooth open the app and link your device by pressing the button on the front. 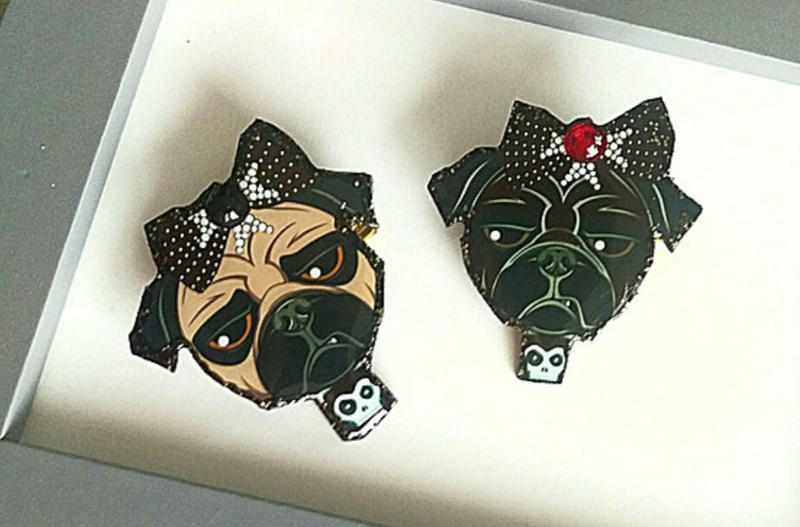 If you have multiple devices or dogs you can name each one and set it as dog/cat or item. The settings menu is simple and easy to alter to your specifications. Changing the battery is super easy too. I was tracked around my house, as when connected it notified human when I moved closer and further away! (so they knew when to hide the crisps!) 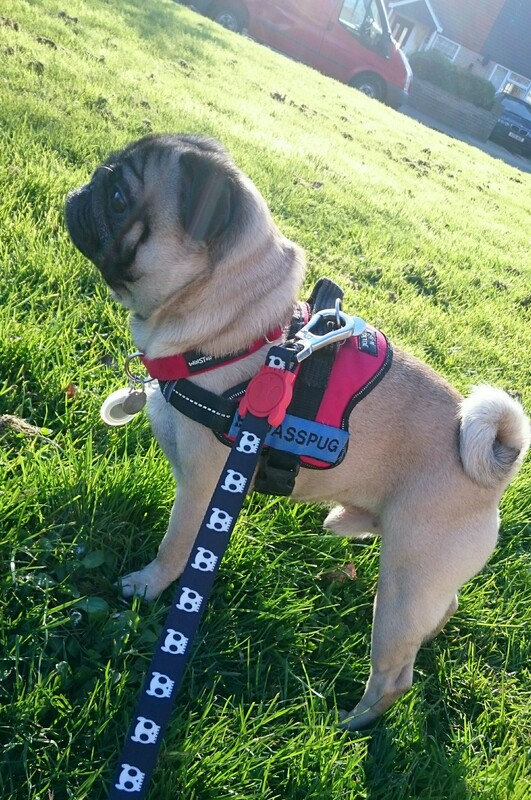 With a total range of up to 100ft dependant on obstacles, It is useful on walks to make sure I dont get lost/run away. Also human noted that if I ran by someone else with the TrackR app while out of her bluetooth range I would be marked on the map using crowd locate (so in essence the more people who use the app the larger the area of distance something can be tracked) so although not a GPS tracker with a large range the potential for traceability has potential. 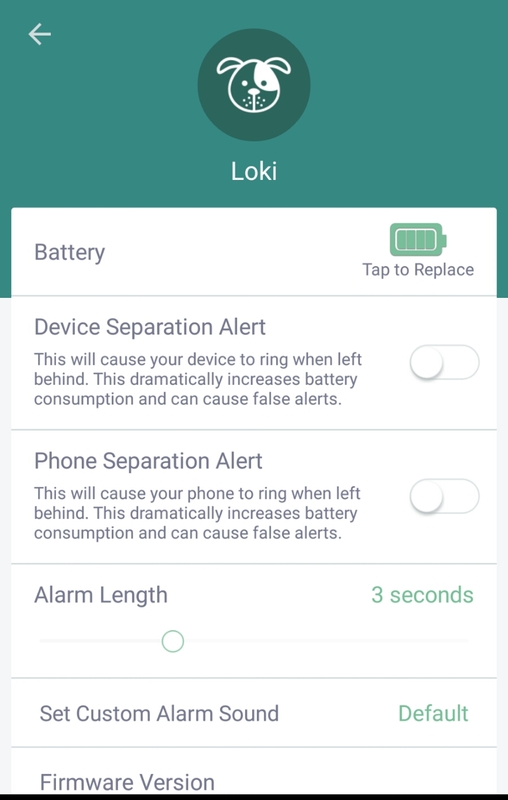 Another cool feature is that if my human presses the central green speaker button (as above on app) an alarm would ring out on the device I was wearing to alert her of my location (hiding in the bed just got harder) and likewise vice versa pressing the button on my device would initiate a ringer on her phone. 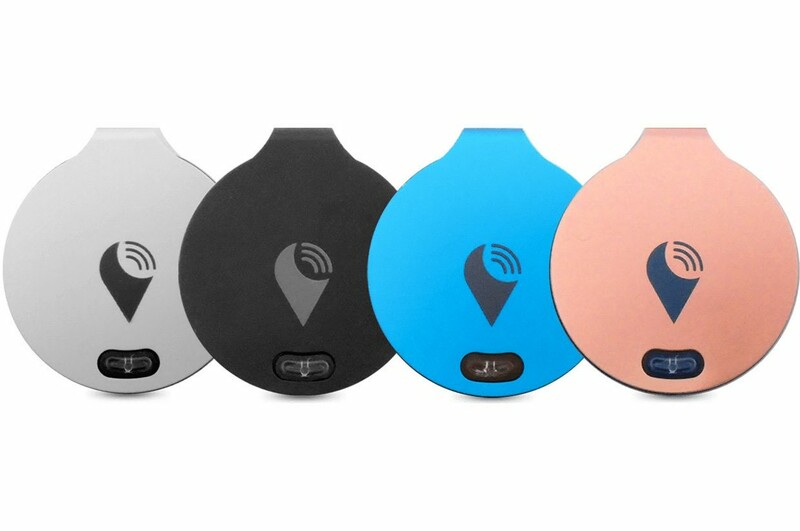 Overall we feel this device is good, It would be great if it was GPS BUT its thin design and the potential of tracking using a crowd network is an impressive compromise. Its other plus points include a distance indicator and separation alert. Although we feel an extra charge for a different colour is silly -This device is that extra security that makes all the difference and gives that little extra piece of mind. 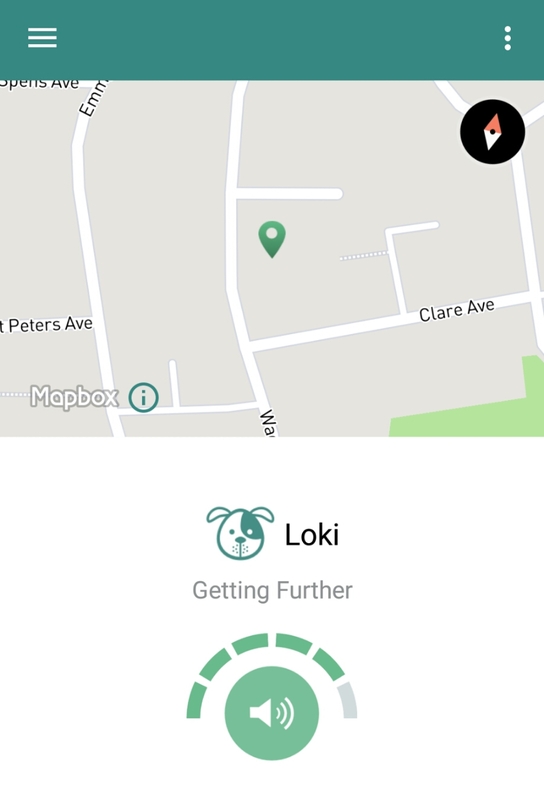 I feel the application to pet tracking could be a huge positive and a growing community of pet owners using the app will be beneficial to everyone else in the long run. 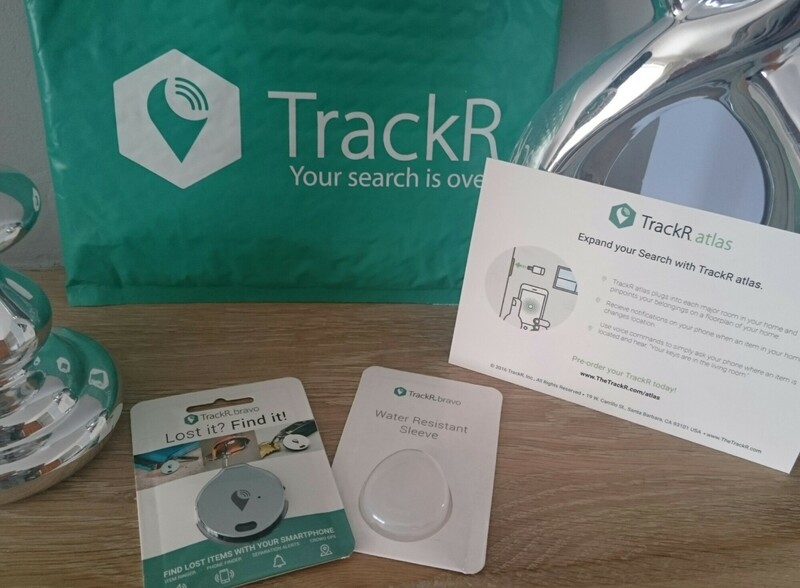 Use our link and you can unlock a FREE TrackR device. Head over to our Instagram @badasspug_don_loki for your chance to win your very own Bravo device and water resistant sleeve now! It took a while for my neck to heal but its finally good and got my hair back! After a little research it seems that licking our feet actually feels good to us dogues and it becomes a behaviour (like a habbit) of course it could be a medical issue such as yeast infection etc etc so if you obsessively lick your feet, dont rule that out yet, but we know for me, thats not the case. So how to tackle this (human thought) as she thinks eventually I will make my feet sore. Now hopefully these 5 tips will help in reducing the time of obsessive licking, the key really is to occupy more time with more productive activities, keeping the mind off the feets! You know us dogs are really smart and boredom can make us do crazy things. Even something simple like having a kong with some frozen yoghurt (last longer than peanutbutter). We are going to put this to the test (myself and my bro from another mo). 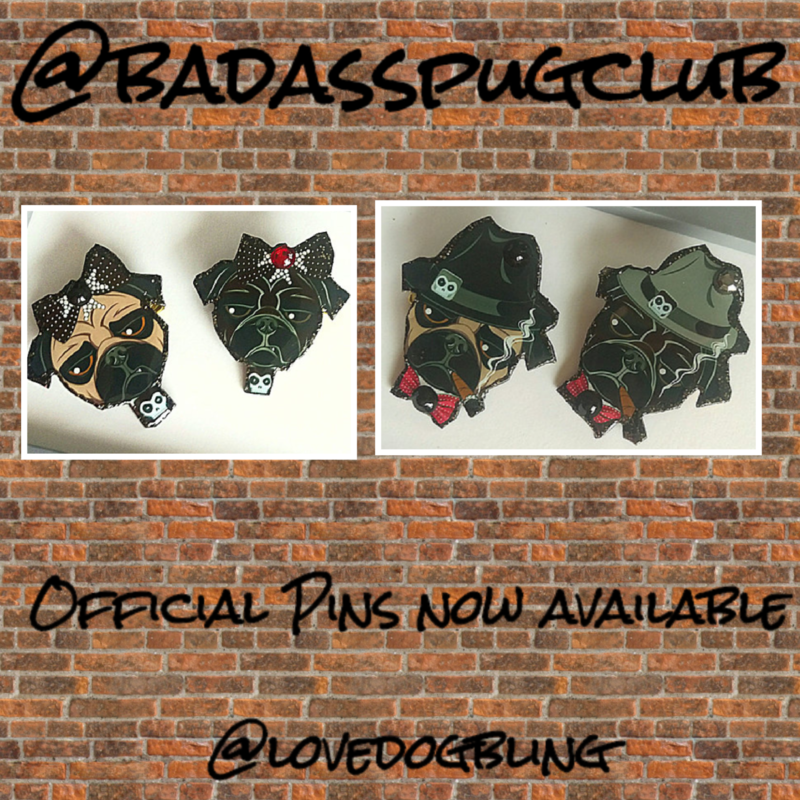 Its so exciting, the badasspugclub has teamed up with @Lovedogbling to create an official club pin! the club has come so far since its start in 2014 and still has so much to grow and expand with so many ideas we hope to make the club an empire of badassness! 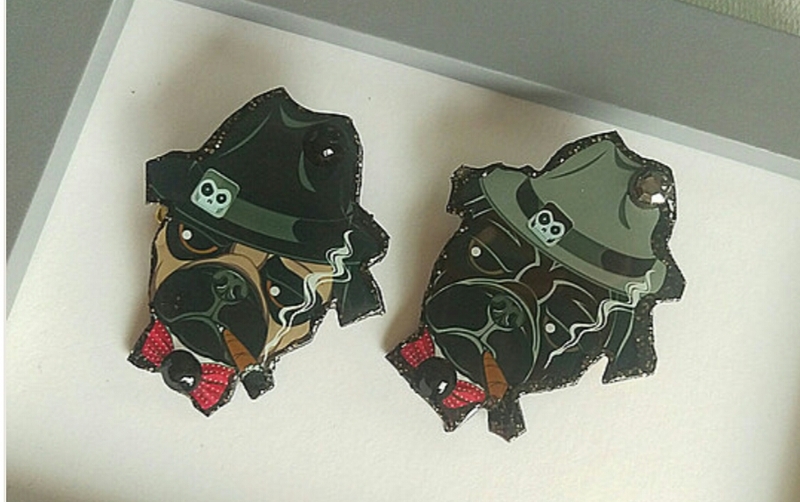 These pins are available to purchase at www.lovedogbling.co.uk for £9.99 each check them out on Instagram @lovedogbling and follow/join @badasspugclub for your chance to win a pin! 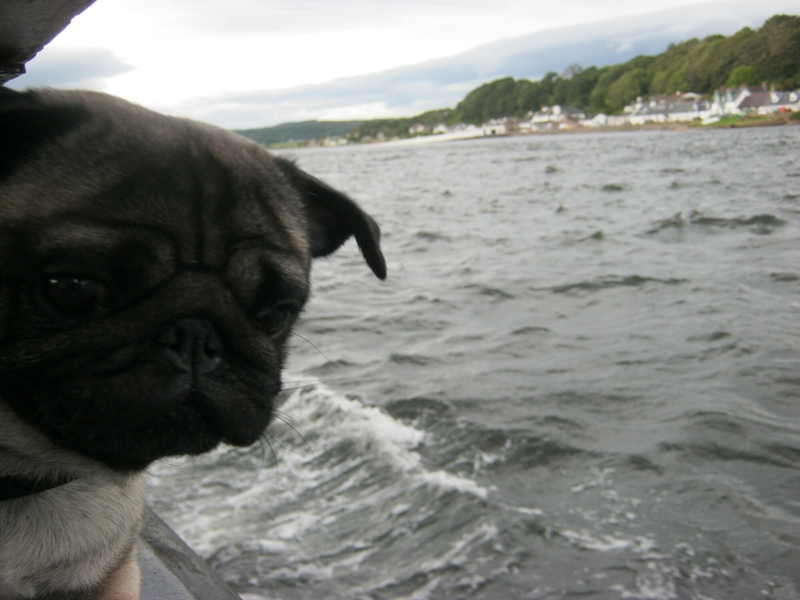 It was a fun boat trip and we learned a lot. we hope to go back next year in the summer so we can see the dolphins properly! 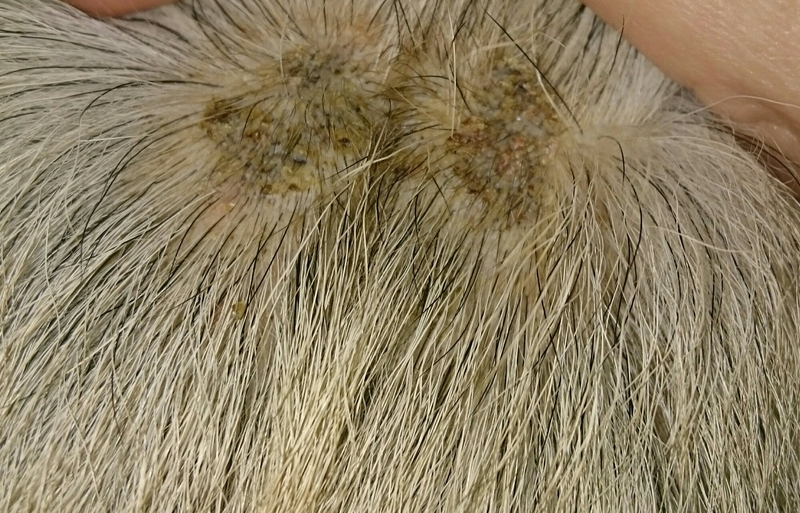 Located on the back of my neck hidden well within my scruff it was hard to get to! And the human seemed quite perplexed as to where it came from! 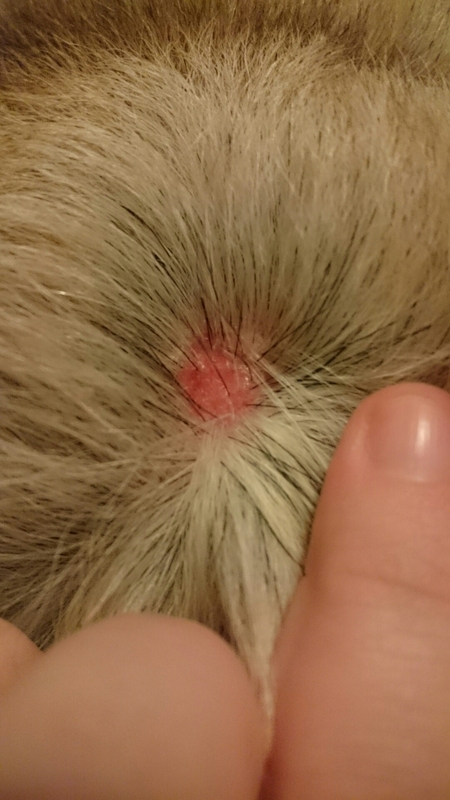 I did fall off the bed the night before (dont tell anyone) but that was too recently as it already had scabbed over, maybe a tick from my holiday – but that was too long ago. So as of now we are putting it down to scratching! The human cleaned the area and dried it, and put some antiseptic cream on for me (which helped with the itching too) and has been keeping an eye on me and yelling at me if I scratch. Today its not all red and bloody but still very scabby and itchy as ive been trying to scratch at it. The human got a better look after ages trying to part my hair (she said she may have to cut my hair!) 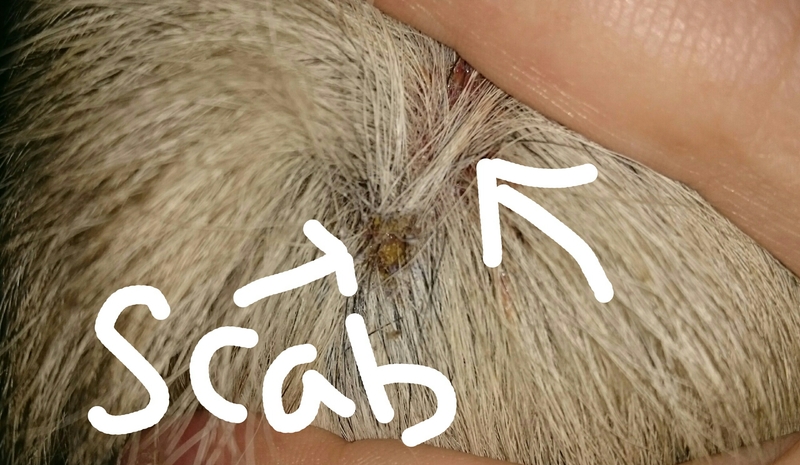 and I have alot of scabs which are all stuck in my hairs, when you pinch the area its quite tough,not hard but almost like there is a lump beneath the surface, like when you get a mosquito bite, We have repeated the process of cleaning and using the antiseptic cream and will keep you updated! to the naked eye it seems normal and its not until you really feel under the fur (damn double coat) you know its there. A new patch. Looks like the cone of shame is making a comeback! 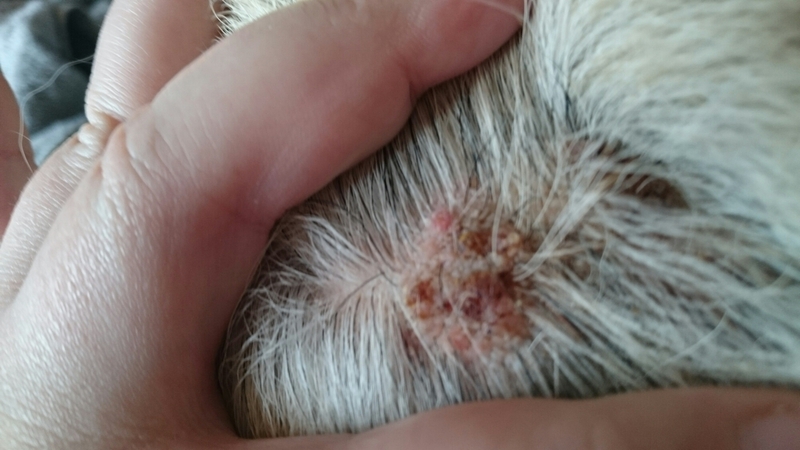 Got a bald spot, conclusions are circling around either a rouge tick which is now gone or a hotspot, yesterday I had a bath with my oatmeal anti itch natural shampoo and a flea/tick/worm/mange treatment just incase. 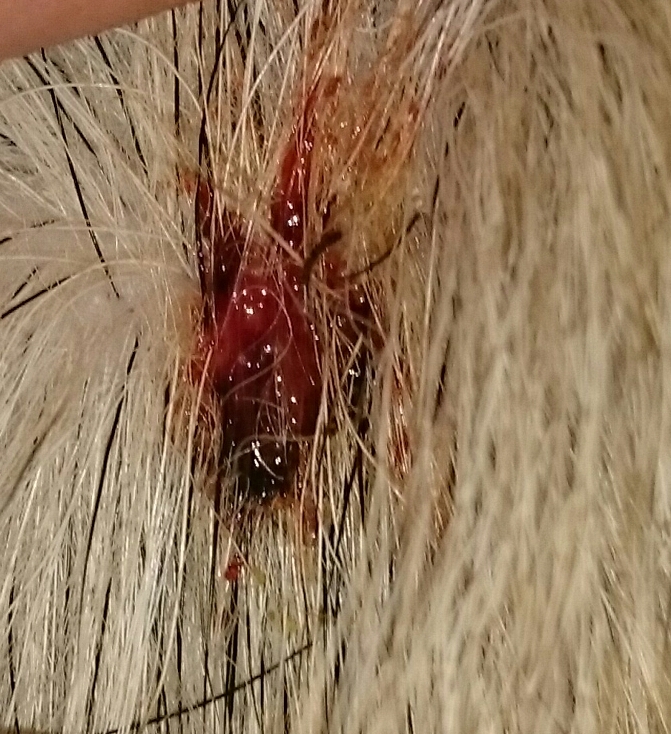 We cleaned away the scab fragments stuck in my fur and got the area nice and clean, dabbed dry with some tissue and left open (no cream) human got the cone out to ensure NO scratching! Now just 2 patches and a small scab. 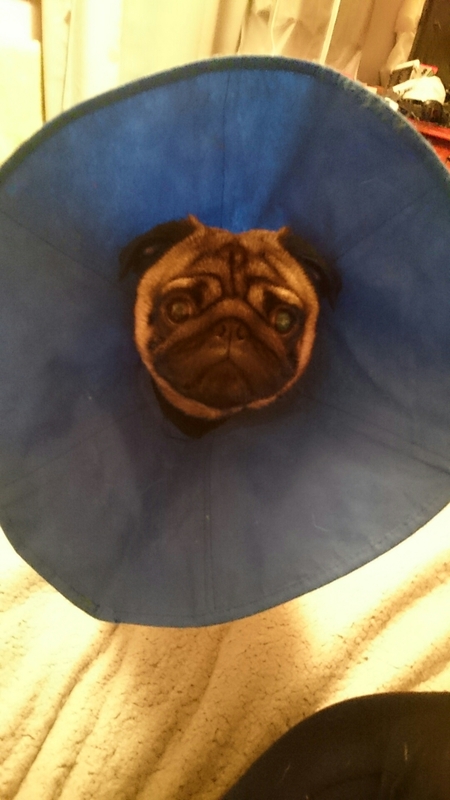 Hoping now Ive had a parasite treatment and got my cone on it will start to clear up, If no improvements by next week, I will be going to see my vet for help. Paws crossed. Its looking better today! 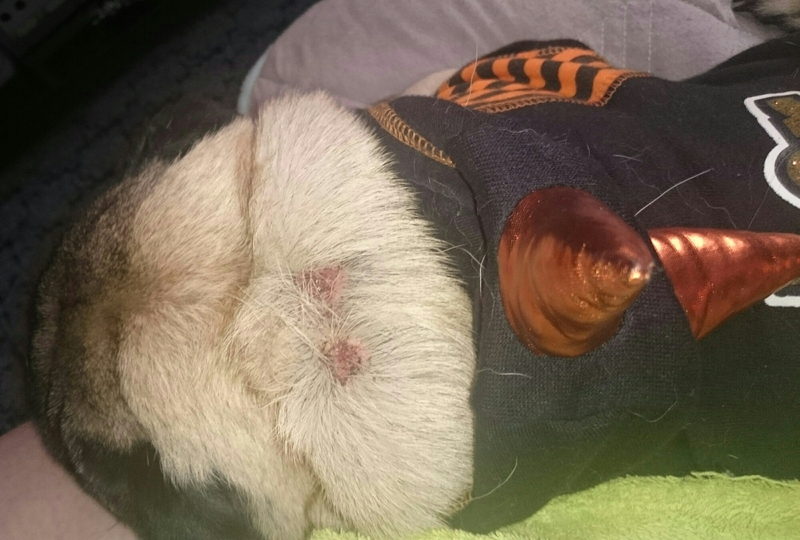 And to have a break from the cone human also got my Halloween hoodie out as being a Pug flower is nice and all but you tens to trip over it alot! Well a week on and I have been wearing my hoodie and havnt scratched at it, so its finally starting to heal well! 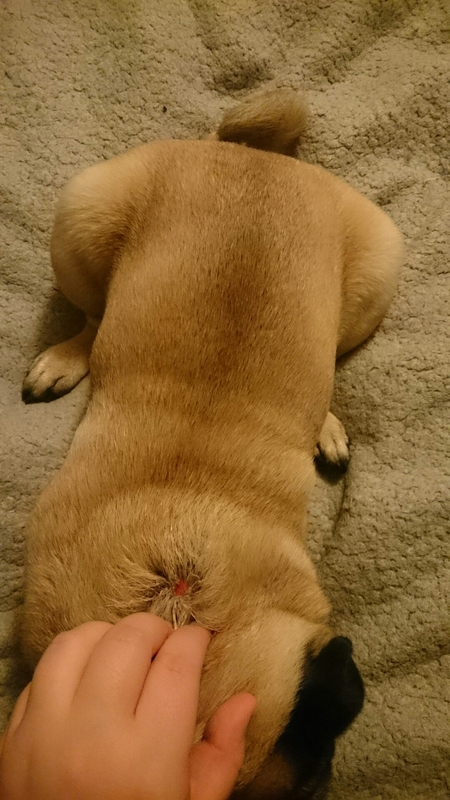 its in a bit of an awkward spot on my neck rolls! Some scab fragments come off from the natural movment of my skin (like when you get a cut in the crease of your finger) it takes a little longer to heal. 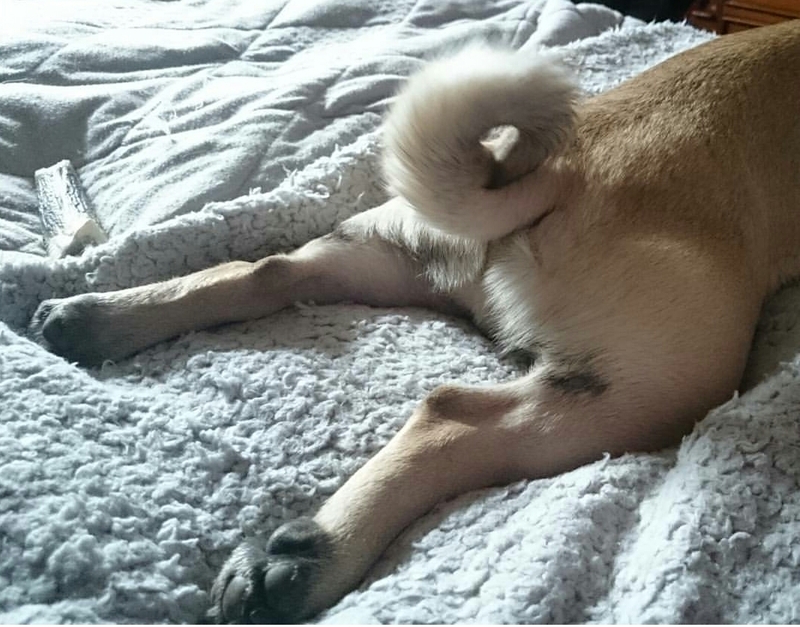 Tomorrow im having a bath to clean away fragments in my fur again and hopefully my hair will start to grow back too! 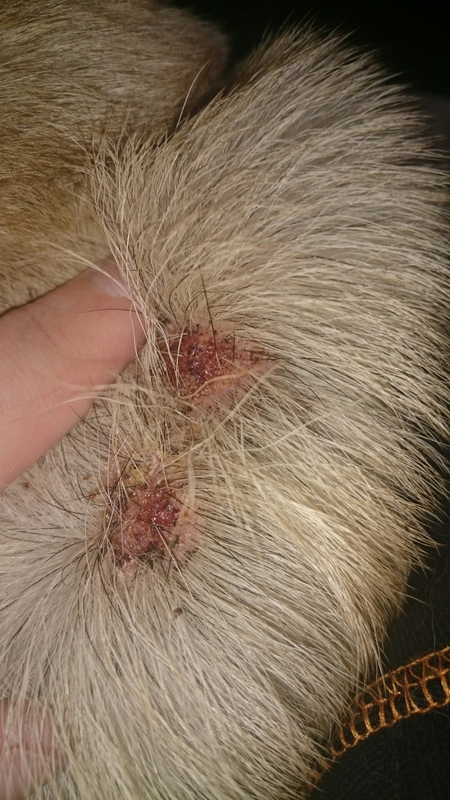 The most likely culprit of this mysterious wound is…ticks! 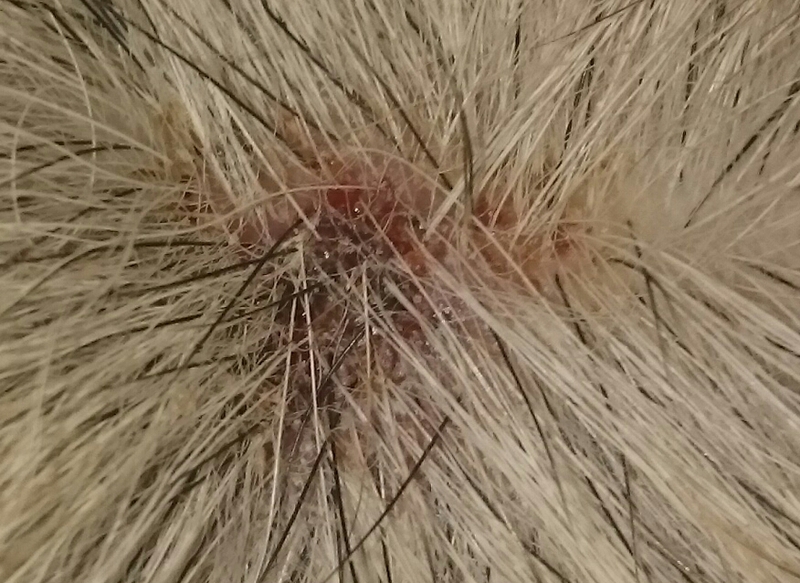 when I went to Scotland I picked some up in the woods, humans thought they got them all but there were some hidden deep in my double coat around my neck (teeny tiny black sheep tick nymphs) they can stay on dogs for up to 3 weeks feeding!! Needless to say next time we go camping and hiking in the woods I will make sure im protected from ticks! Ps. 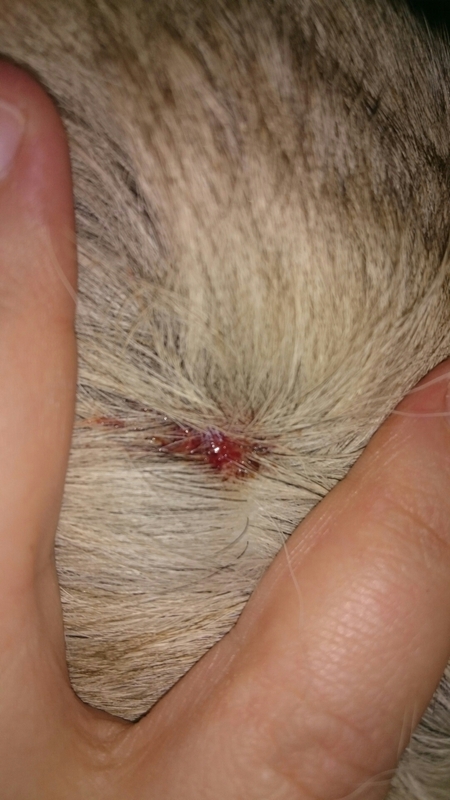 I did make it worse by scratching at it alot and it irritated my skin (Im a sensitive soul) As the bite left from the adult female sheep tick (which they removed quickly) was like a small spot.. .you know the ones humans get (sorrynotsorry) The human would like to add that I am not treated for ticks and fleas every month as they do not like putting chemicals on my skin when its not necessary! but thats another blog. .
More photos when its healed TBC! 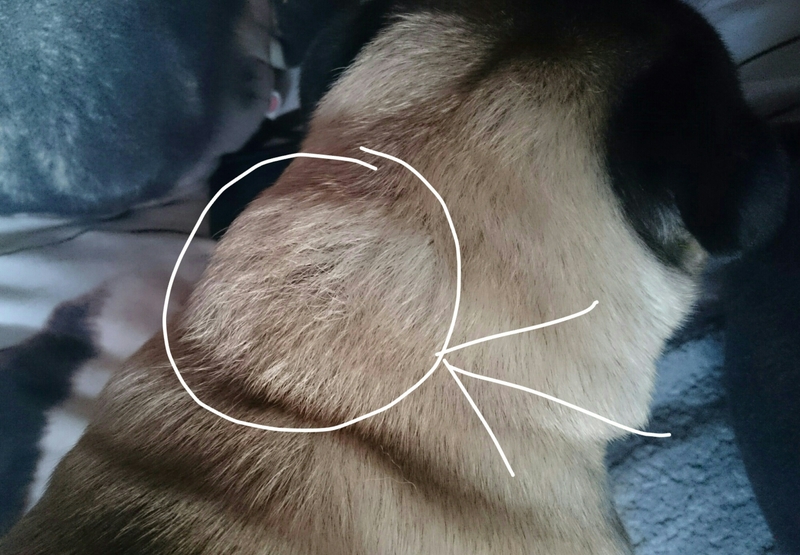 So I ended up going to the vets to have my neck checked out as it seemed to spread like hives all around in a band around my neck and I got lumps and red patches in more places! It wasnt healing fast enough for humans liking. 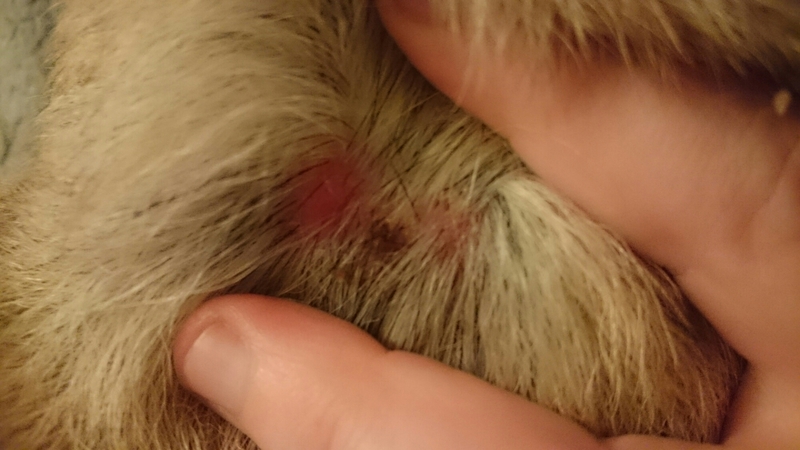 Turns out I was having an allergic reaction…although the vet said we can never been certain 100% what caused it (human has money on ticks) I got an anti inflammatory Injection to stop the itch and 6 days antibiotic pills to help clear the secondary infection, within days my skin had settled all the redness and bumps went away, the scabby bits are still healing and getting back to normal!